This 2ha site is located within the Monash National Employment and Innovation Cluster – Melbourne’s largest established employment cluster. It is the largest concentration of employment outside the central city and includes world-leading research and innovation including the Monash University, CSIRO, Synchrotron, Melbourne Centre for Nanofabrication and Monash Medical Centre. The site of the development formerly accommodated the Clayton Primary School and was rezoned for medium density residential development to provide greater housing choice within the cluster, close to employment, Clayton activity centre and public transport. 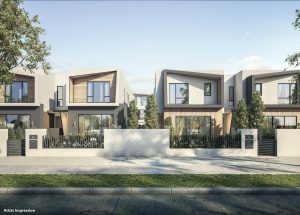 The Development Plan for the site envisages transformation of the vacant 2ha site into a diverse mix of over 250 apartments and townhouses centred around a common green space, and connected by leafy pedestrian-friendly streets. Preparation of preliminary master plan in consultation with the project architects. Preparation of a Development Plan, providing the key planning and design controls for the site. Consultation with key stakeholders, referral authorities and surrounding neighbours. Negotiation with Council up to final Development Plan approval.